The Exchange Variation of the Caro-Kann. 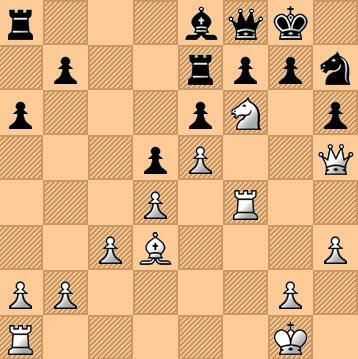 The Bishop at f4 is at an advantageous position. It would be prudent to neutralize the Bishop at once. If 19....gxf6, then 20. Bxh7+ Kxh7, 21. exf6 Rc7, 22. Rf1 ... and White gets attacking position in exchange. If 22....exf6, then 23. Bxh7+ Kxh7, 24. exf6 Rc7, 25. Rg4 ... and White weaves a mating net. If 23....gxf6, then White mates with 24. Rg4+ Kh8, 25. Qh4 and 26. Qxf6. Of course not 24....Qxg7 then 25. Rg4. White would have tremendous material advantage after 25....f6, 26. Qxc7.